It's not the most orthodox approach to getting around in a wheelchair. And you're sure to get some odd looks as you row yourself down the sidewalk, minus a set of paddles. But this chair's innovative propulsion system does more than just miminize arm and joint pain. The RoChair gets its name from its unique center mounted drive lever that's operated with a simple rowing motion, propelling the chair on both the forward and backward strokes. 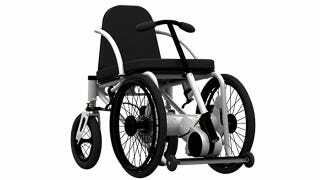 It's actually a notable improvement over the traditional push-rim propulsion system since it not only reduces the risk of strain injuries from repetitive motions, but it also facilitates a drive train with eight selectable gearing ratios like a bike. Rear wheel steering, which allows it to turn in its own footprint, is controlled by simply turning the drive lever. While braking and shifting gears is handled by twisting the left or right hand grips. For slower speeds, or tighter maneuvering, the RoChair still has large front wheels with push-rims that allow for more precise movement. But at just 20 inches tall they also make it easier to get in or out of the seat.